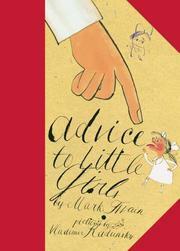 Crisply satirical and a little subversive, Twain’s short, acerbic sendup slyly exhorts little girls to take a calculating approach to manipulating friends, brothers and elders. Originally published in 1867 as a sketch in his collection The $30,000 Bequest and Other Stories, Twain’s advice acknowledges the not-all-sugar-and-spice nature of girls (thereby skewering the gender-driven double standard of his time) by suggesting expedient alternatives for getting what they want: “You ought never to take your little brother’s ‘chewing-gum’ away from him by main force; it is better to rope him in with the promise of the first two dollars and a half you find floating down the river on a grindstone.” Radunsky’s mixed-media illustrations incorporate 19th-century clothing, attractive calligraphy and scribbled, blotchy ink sketches to evoke both the period and the disarming playfulness behind Twain’s excoriation of manners. The intended audience for this handsomely designed clothbound edition is unclear, as the humorist’s irony will evade most young children and a fair number of adults. Those who do get it will relish it.